The West African Ebola epidemic, the largest in history, started with cases in the forested rural region of southeastern Guinea and reported by the World Health Organization (WHO) on March 23, 2014. Soon cases were discovered in Liberia and Sierra Leone (bordering countries of Guinea). Identification of cases was difficult because of weak surveillance and a fragile public health infrastructure. Poor infection control measures and strained health care systems also contributed to the devastation of this outbreak. By August 2014, WHO declared the situation a Public Health Emergency of International Concern (PHEIC). CDC collaborated with U.S. government agencies, Ministries of Health of affected countries, WHO, and national and international partners in an intensive effort to end the epidemic. The outbreak was declared over in June 2016. In the fall of 2014, the Narsarah Clinic developed a multifaceted strategy to prevent the spread of Ebola in their community. 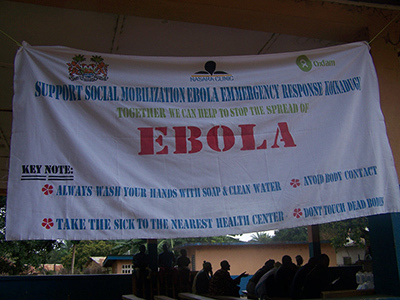 They collaborated with local chiefdoms and government agencies to educate people about how the virus is spread. They also provided tippy-taps for better personal hygiene, and they established a monitoring system for people coming and going. Because of their efforts, they were able to prevent the spread of the virus in their region. Click a photo below to view the slideshow. Ebola virus was first described in 1976 near the Ebola River in what is now the Democratic Republic of Congo. Since then, the virus has emerged periodically and infected people in several African countries. Each of the known cases and outbreaks of Ebola Virus Disease are described below by year or country where the case was discovered or imported.